Bushes are used in engineering to provide a high quality bearing surface in a component. Not only does this mean that the main component will move more smoothly over a pivot but that, once the bush has worn out, it can be replaced with a new one leaving the main component undamaged and like new. The picture above shows one example of how bushes are used in a ‘BRIGGS’ accordion. 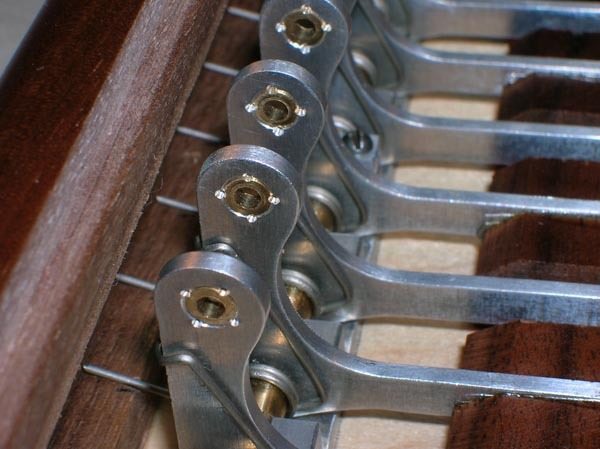 The bass levers are actuated by steel rods running in brass bushes pressed into the main bass levers. This means the mechanism will be very slow to wear out indeed. Even if, after many years, there is wear in the mechanism, the bushes can be replaced, restoring it to as-new condition.